When I am teaching and lecturing there are often questions about milk. Many people believe it is better to drink soy milk. Is it? Lots of parents worry about giving their kids whole milk fearing weight gain. Most believe milk is a necessity. I sort of like Marion Nestle’s (What to Eat) take on milk – it’s just a food. Not magical or better than other foods, not worse or more evil than other foods. When I express this point of view at parent groups I invariably get a sad face exclaiming, “But what will my kids eat on my cereal?”. I respond with another question – “Why are you eating cold cereal? More importantly why is it a staple for your children?” It is, after all, refined, manufactured, usually sugarcoated, mostly empty carbohydrates. The lifeless stuff does not resemble its once-alive natural source (compare oat groats to Cheerios). And it’s dry – can’t be choked down without something wet on it. Once when I was talking to a grade school parent group a large serious man raised his hand and said – the difference between dog food and cereal is that the cereal has sugar. That was funny. And pretty close to the truth. 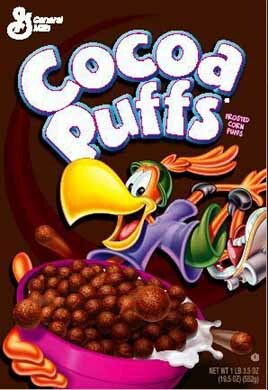 Are you cuckoo for cocoa puffs?